Is Phi a Fibonacci furphy? » Is Phi a Fibonacci furphy? The science show Catalyst recently ran a piece debunking the Phi myth. The reporter (Dr Paul Willis) sets out to demonstrate that the so-called "natural appearances" of the Golden Ratio, Phi, is an urban myth. The ratio Φ (the Greek letter Phi) can be obtained by taking a term of the Fibonacci Sequence and dividing it by the term before. In the da Vinci Code, Dan Brown claims these mathematical curiosities can be found in the nautilus shell. It’s found by measuring from the centre to the outer radius and dividing that by the distance from the centre to the inner radius. 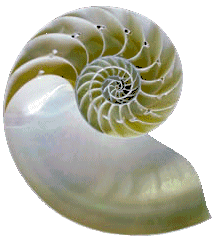 They measure a nautilus shell’s inner and outer ratios and find that the ratio is close to 3, not 1.618. Let’s have a look at the most famous claim about Phi appearing in nature is a person’s height divided by the distance from the naval to the floor 1.618? At this point, they proceeded to (very roughly) measure a female model’s height and distance from the floor to the navel. The ratio was close (1.592), but not Phi. But wait a minute. Leonardo daVinci’s famous Vitruvian Man is an idealised figure (in the tradition of the Greeks, who drew and sculpted "perfect" people based on certain ratios). In the following Vitruvian Man drawing, the navel is at the dead center of the body and the extremities of the legs lie on a circle. When the arms are drawn outstretched, the extremities of the hands are on the circle. The ratio of the total height to the height of the navel is (very close to) 1.618. So while us mere mortals do not have such perfectly proportioned bodies, I’m not sure it completely debunks Phi. ... Let’s try the insect world. According to Fibonuts the ratio of female to male to male bees should be Phi, 1.618. A female bee has both a female and a male parent, but a male bee has only a female parent, so if you count up the number of parents and grandparents of each generation, you get a fib number. So I don’t really regard this as debunking the natural occurrence of Phi when it comes to bees. Willis was listening to the wrong story. Now we turn to sunflowers. The obvious thing your eye catches are these spirals going out like that, and if you count the number of spirals going clockwise, that will be a Fibonacci number, and if you count the spirals going counterclockwise, it will be an adjacent fib number. 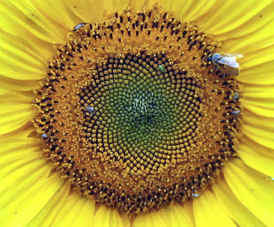 So, Phi is not found in the spirals of a nautilus shell nor the proportions of the human body, but the Fibonacci sequence reveals itself in the ancestry of bees and the head of a sunflower. But, that’s still a strike rate of fifty/fifty, not bad for an urban myth really. Actually, I thought this was pretty bad television. Many of Catalyst’s stories are very interesting, but every so often they do a pseudo-scientific piece, complete with ’smarmy’ tone, like this current ’study’ on Phi. I think it was supposed to be anti-Dan Brown. But if any students were watching it, they would have walked away being cynical about their math teacher’s attempts to make mathematics interesting using Golden Ratio. You may be interested in Math of Beauty, where you can check the mathematical beauty (or otherwise) of several famous people using a Phi-based mask. Update: Carver, from the Philippines used Photoshop to re-organise his own face using the Math of Beauty mask. Hello Zac. I just found your comment on my "structural beauty" post. I really had a fun time altering my face, and there are times when I wish my face was a bit more "proportional." It gets frustrating always having to use my "good side" in photographs. Hi Carlo and thanks for your input. Probably all of us wish our faces had some other proportion, or skin tone, or something. Maybe we are genetically pre-disposed to be unhappy with our appearance...? "Maybe we are genetically pre-disposed to be unhappy with our appearanceâ€¦?" I did enjoy that image, Nick! Thanks also for the book recommendation - I'll check it out. If you think your looks are not perfect now, wait till you are 68 going on 70. I recall years ago taking a maths class on an excursion where we looked for Fib nos in nature. Flowers and pine cones worked well. But nowhere could we find tree branches giving examples. Bummer.